I’ve been scratching my head for a while now trying to get a salty snack I can bring on rides with me. And yesterday it hit me: cornbread! It is simple, quick to bake and can easily be made dairy-free and gluten-free. In a small bowl, whisk together milk, eggs and oil. In a medium bowl, stir together cornmeal, corn flour, sweet rice flour, sugar, salt, and baking powder. Pour into lightly greased 9 inch square pan. Bake for 20 minutes, or until knive comes out clean. After 12 minutes of cooking sprinkle some coarse salt and fresh rosemary on top if you want some extra salty flavor. 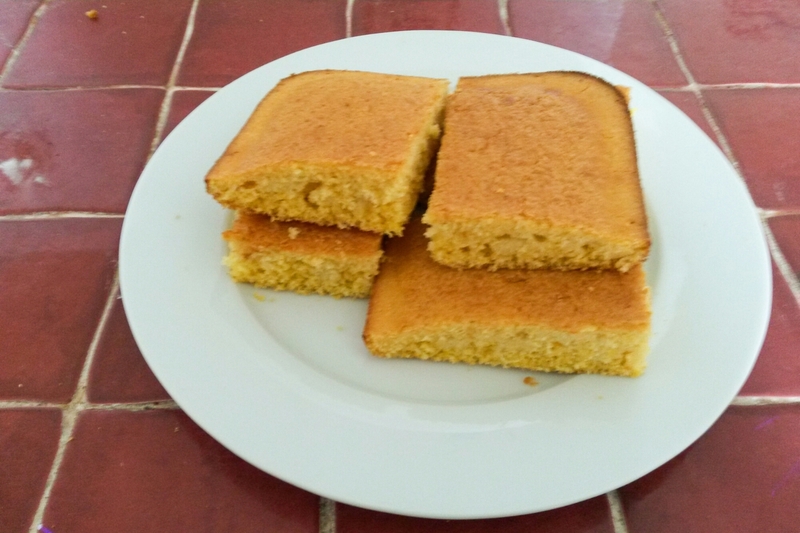 Cornbread is versatile and can be paired with sweet (jam, honey cashew butter…) or salty (eggs, bacon, goat cheese…) food.